Found myself in a grove of trees at the Huntington Gardens late Sunday afternoon with a ton of hummingbirds and butterflies. Got lucky on this one -- there was a tree or brush with yellow flowers in the background and I was hoping a bird would show up in the foreground. And it did! 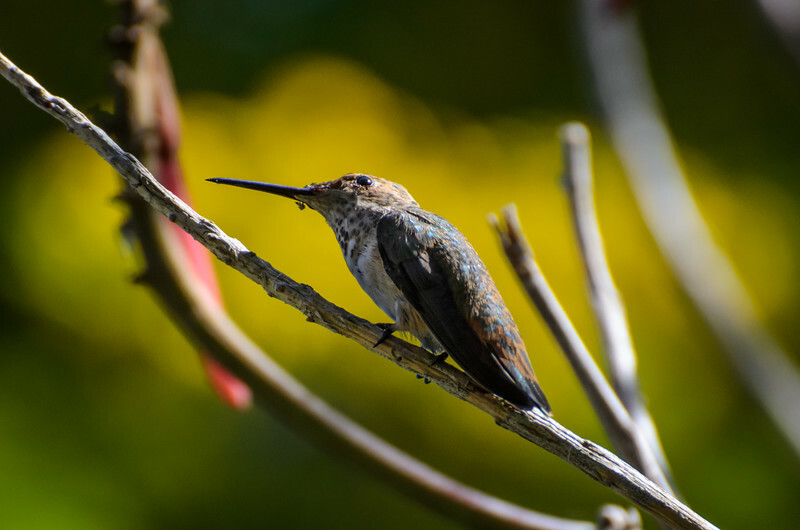 I believe it's a female Allen's hummingbird but I'm not very good at identifying these things. I shot the photo with my Nikon D5100 and Nikon DX 70-300mm lens at 1/1600, f/5.6, 300mm and ISO 800. There was a fair amount of noise that I managed to somewhat subdue in Lightroom. As per usual, I sell prints from my SmugMug site--they do a nice job with prints and they're inexpensive. An 8 x 12 on metallic paper -- my preferred paper -- is $10.95.